Click on a video and then click 'subscribe'. If you do decide to go shopping for cryptos during these price declines may I recommend Binance, probably my favourite exchange right now. My referral link is: https://www.binance.com/?ref=10890655 but as ever I do not recommend storing your crypto on any exchange so bear that in mind. A lot of people look at Coinmarketcap, I used to have a segment on the show every day using it but I dropped that considering the numbers are changing in real time. Plus, once we get into a situation like this, there are only a couple of numbers that I find informative. Right now we’re sitting at $377b. Having peaked at around 830b the first week in January. That represents a reduction of approximately 54% in overall market cap, which is $448b in overall dollar value. I have heard people describe this as being value wiped out, however I think it’s more accurate to say that amount of value has left the crypto space by being transferred back to the old financial system. This is a function of the cryptocurrency revolution being global. Never before have so many people been able to participate and it’s the internet that allows everyone to participate. The second number I think is valuable is the 24 hour volume at $22b. That seems low but it’s more sane than the hundreds of billions of volume we were turning over during the recent mania. When prices kick off again, you watch this number climb rapidly. Then the fun number to look at is the winners and losers, which can be quite comical on coinmarketcap since they include the whole list of coins. If I’m not mistaken Metal is the highest cap coin on this list with a 20% gain on the day, wow, I think anyone would be pleased with that today. The Bitcoin chart is having a big old battle around 8,000 but unfortunately at the moment is gradually eeking lower. By that I mean we have set a couple of new lows, one yesterday and another one today. They are only slightly lower but lower nonetheless. We can inspect them in more detail on the hourly chart. 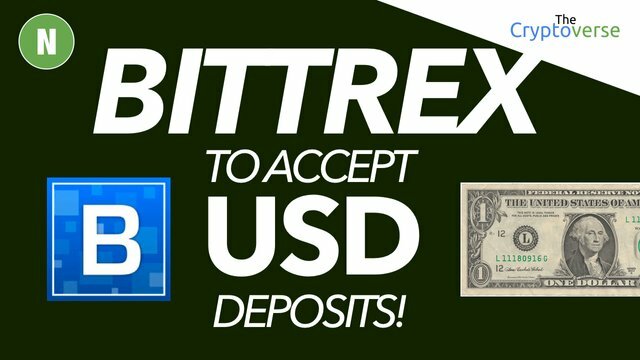 In an interview with the CEO of Bittrex it came out that they will soon be accepting US dollar deposits directly. That means no longer would you have to buy Bitcoin on Coinbase or Gemini and then transfer it to Bittrex to buy altcoins, its a one move directly from your bank to Bittrex. When Bittrex launches US dollar deposits we may well see some altcoins trading directly against the dollar, that would be interesting. Bearing in mind Bittrex supports 190 different cryptos. You can listen to the full interview using the audio player embedded at the bottom of this article. The other thing that is generally bad news but potentially good news for crypto, as far as I know on the 8th of February the US government is going to hit it’s funding limit again. I’m sorry I don’t have a source for this so perhaps someone can help me out by posting something in the comments. Chris I laughed so hard when you so honestly called the fiat/crypto hassles a Royal PITA I nearly spit my chips out of my mouth. I just loved that blunt honesty. Do you think because of that -- they will now clamp down EVEN FURTHER on their police stating of accounts and related customer policies, causing so many people grief???? Would realllllly love to hear your thoughts... because I would bet it makes things EVEN TIGHTER!! I think yes. When you introduce fiat, you introduce much higher chance of money laundering. Or at least that will be the excuse. In any case Bittrex will have already had to jump through these hoops to get approval to process fiat anyway. Thanks for taking time to answer me Chris. It is appreciated. I'm really glad that Bittrex is going to accept fiat deposits soon, but I've heard that many people have had trouble with locked accounts due to issues with verification. I'll probably just continue to use Bitstamp/Kraken, which isn't without issues either. I wonder of the move for Bittrex will impact the BTC demand in the short term and if will lead to a even lower BTC Dominance figure. I have been waiting for and resergence of BTC dominance to 45-50% but instead others have dominated (like ETH). The market continues to evolve in interesting ways. With BTC fees continuing to be high and now with USD going to be accepted by Bittrex. I see more future demand for alts. Bittrex accepting USD. One more reason why 2018 will be the year of the altcoins. Good news are coming.. ! Maybe we can uncouple from BTC attachment, hopefully fiat pairs are introduced! When will prices start to go up?? Is this dip all because of Chinese new year?? Really a good channel with awesome contents.Carry on!! Nice! I hope they also add other currencies in the future. It will be much more exciting to use if you can also use bittrex as a forex. I would still not trust USD transfers to Bittrex until it's firmly established. It would be nice to see a large financial (E-Trade/TDAmeritrade/Charles Schwab) jump in to offer an checking account with a simple on/off ramp. It only needs to be one, the rest will follow. I did like all the coins on binance, I just thought their UI was not very intuitive. Good news for US citizens about Bittrex accepting US dollars. Now I just wish they would accept new users. I tried again after seeing this videos. Sigh... Seems rather frustrating as a US citizen not to be able to participate within some of the crypto space and then add being a new user. All at the best time too when prices are low. It's time to buy!